I took Fargate on ECS for a quick spin the other day. My idea was to use reveal.js for serving slides about Docker in a Docker container – something I have shown last year at OUGN 2017 in Norway. To make this Docker container run serverless on AWS Fargate I created a new task and specified the container as shown in the webcast. I recommend to get started with the ECS quick start wizzard. It does help if you understand about ECS tasks and services. Surprisingly the hardest part is to find the correct IP to be able to connect to the running container. Note that there is obviously no EC2 instance and the ENI is attached to the ECS task. So you can find the IP under Task -> public IP4. Today I realised that my Serverless with Fn on Kubernetes article was published on DZone. That is great news. 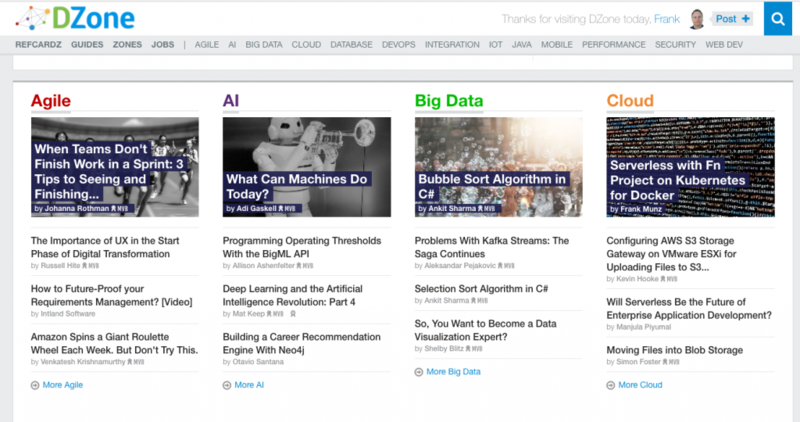 Not sure why, but I didn’t pay too much attention to DZone but realised lately that so many good content is published there. E.g. check out the refcards! At the time of writing there are more than a dozen FaaS frameworks or platforms available. These frameworks or platforms can be classified into three different categories based on their objective and reach. Reduce the complexity of a particular vendor’s cloud based FaaS implementation, e.g. the configuration of the API gateway and access management that is required for a REST based serverless function. A typical example for this category: AWS Chalice. Provide an abstraction framework for portability and ease of use on top of the FaaS implementation of various public cloud providers. A popular example is the serverless.com framework. Provide a standard based, serverless platform or framework to abstract running functions from the operation of servers. These frameworks are typically developed without a particular cloud provider in mind. When running such a framework on top of IaaS, servers are abstracted away, automated scaling is possible, but no true per invocation is achieved due to the IaaS pricing model. Examples for this category are Open FaaS, and Fn Project.